The figures in this Nativity are knitted from wool yarn in Peru. 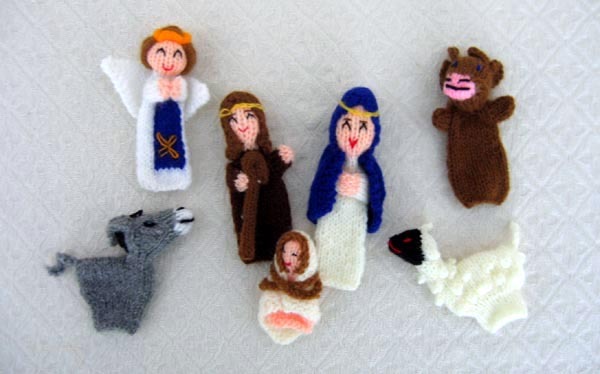 The finger puppets include: Mary, Joseph, baby Jesus, angel, sheep, donkey, and cow. The figures are approximately 3.5 to 4 inches tall. The puppets are made by artisans from the Manos Amigas group in Peru. The women who make the finger puppets walk around knitting everywhere they go. Manos Amigas is a nonprofit organization connected with an evangelical Assemblies of God church is located in Lima. Manos Amigas, which means “hands joined in friendship,” works with individual workshops, groups and associations that make ceramics, jewelry, musical instruments and Christmas ornaments in Lima and in the Andean highlands.